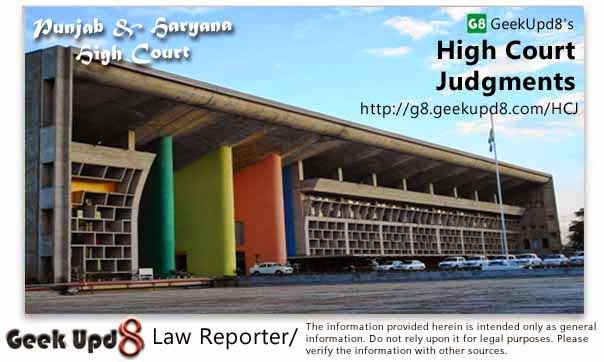 For the Petitioner :- Ms. Satpreet Grewal, Advocate. For the Respondent :- Mr. Ramandeep Sandhu, D.A.G., Punjab. Virender Singh, J. - Petitioner is seeking quashing of Criminal challan No. 38/1/02 registered under Section 182 IPC, Annexure P-4 and the order dated 16.7.2002 Annexure P-6 vide which the cognizance of the same has been taken by the concerned Court and all the subsequent proceedings arising therefrom. 2. Pursuant to the notice, State has also filed reply to the instant petition. 3. Petitioner was working as maintenance contractor and he was given a contract of maintenance and repair of Oswal Sugar Mills Ltd., Mukerian in the year 1996. On his complaint a criminal case bearing FIR No. 51 dated 31.12.1996 was registered against Ajit Ram and Hardial Krishan under Section 13(2) read with Section 7 of the Prevention of Corruption Act, 1988 by Vigilance Bureau, Jalandhar. Ultimately, the aforesaid accused were acquitted by learned Special Judge, Hoshiarpur vide judgment Annexure P-3 dated 11.2.2002. Vigilance Bureau, Jalandhar after the acquittal of aforesaid two accused filed a Calendra Annexure P-4 under Section 182 Cr.P.C. against the petitioner. Along with the Calendra, an application Annexure P-5 under Section 195 Cr.P.C. was also moved. The petitioner was produced before the concerned Court along with the aforesaid Calendra vide Annexure P-6 he took the cognizance of the offence. Subsequently, vide order Annexure P-7 dated 19.8.2002, the learned trial Court issued notice under Section 182 of Indian Penal Code against the petitioner. Through the instant petition, the petitioner seeks quashing of aforesaid Annexures P-4 and P-6 respectively. 4. While issuing notice of motion pronouncement of the final order was ordered to be stayed. However, trial Court was directed to continue with further proceedings. 5. I have heard learned counsel for both the sides and perused the record. 6. Ms. Grewal, learned counsel for the petitioner contends that the conceded position is that State of Punjab has not preferred any appeal against the judgment Annexure P-3 vide which Ajit Ram and Hardial Krishan have since been acquitted. She then submits that the petitioner, in fact, had not resiled from his previous statement. Rather the other two witnesses namely Ramdhan, Jr. Assistant and Yashpal who were shadow witnesses failed to support the case of the prosecution. She then contends that learned Special Judge, Hoshiarpur returned totally a wrong finding while acquitting the aforesaid accused which in any case is not challenged by the State by way of an appeal. Even if the accused have been acquitted by the trial Court disbelieving the present stay, it does not amount to giving the false information to the police which would bring the case within the mischief of Section 182 of the Indian Penal Code. The petitioner could be booked under the said section only if the prosecution agency instead of filing the challan against the aforesaid two accused had come to the conclusion that the petitioner had given false information knowing it to be false with intention to cause public servant to use his lawful power to the injury of another person. The present case is certainly not of that type as both the accused were apprehended at the spot by the Vigilance Bureau. 7. The learned counsel while strengthening her arguments further submits that the learned trial Court while deciding the main case registered against the aforesaid Ajit Ram and Hardial Krishan, could at the most return a finding against the petitioner for giving false evidence during the judicial proceedings punishable under Sections 193 and 194 of Indian Penal Code but there is no such observation and therefore filing of Calendra Annexure P-4 under Section 182 Cr.P.C. and taking cognizance thereof (vide Annexure P-6) by the trial Court is sheer abuse of process of law and the same deserve to be quashed under Section 482 Cr.P.C. 8. Learned counsel then submits that the application under Section 195 Cr.P.C. (Annexure P-5) moved by the concerned police official is not maintainable in the present set of circumstances. 9. Learned State counsel has half-heartedly controverted the arguments advanced by learned counsel for the petitioner and states that the petitioner in fact was declared as a hostile witness because he had not accepted the procedure adopted by Vigilance team and this resulted in the acquittal of the two accused who were booked in a case of corruption. Learned State counsel then submits that may be State has not chosen to file an appeal against the judgment of acquittal presuming that it would be of no fruitful purpose, but the acquittal of the accused is primarily on account of the statement of the petitioner who did not support the case of the prosecution in true terms and, therefore, he is liable to be punished under Section 182 IPC. 10. After hearing learned counsel for both the sides and having gone through the facts of the case, in my view the Calendra under Section 182 IPC the order Annexure P-6 and all subsequent proceedings initiated against the petitioner deserve to be quashed for a very simple reason that after a full fledged trial, the petitioner could not be booked for giving false information to the police as punishable under Section 182 IPC. The prosecution agency could initiate the proceedings against the petitioner for the said offence only during the investigation of the case finding that the information supplied by the petitioner was false but not after submitting of challan under Section 173 Cr.P.C. against the accused to face trial. In the case in hand, the position is rather better as during the trial, the petitioner was declared hostile by the Public Prosecutor and therefore, if his substantive statement was to be dubbed as false evidence, he could, at the most, be booked for the offences punishable under Section 193 or 194 IPC that too after giving of verdict against him by the trial Court. In view of the above discussion Calendra Annexure P-4, the order Annexure P-6 and all subsequent proceedings arising therefrom are liable to be quashed. Ordered accordingly. Resultantly, the instant petition is allowed.